Our Bourbon Red Heritage Turkeys are known for their juicy, rich flavor and also their beauty. We raise ours on pasture and woods so that they have access to grass, yummy bugs and worms! Raising Heritage Turkeys verses the common white turkey is a bit more expensive, however it is well worth it. 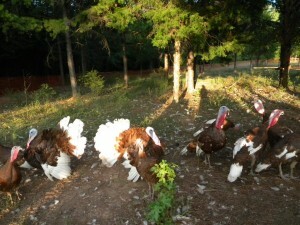 Heritage breeds take about thirty weeks to reach market weight while the common turkey only takes about eighteen weeks. Also Heritage Breeds are able to reproduce naturally whereas the common whites can not due to their unnatural large breast size and weak legs. We have a limited supply of our Bourbon Reds so if you would like to have one for 2011 Holidays let us know ASAP, they go fast.